SUBHEAD: These die-offs are different, much different. All-out alarm is warranted with bells clanging! 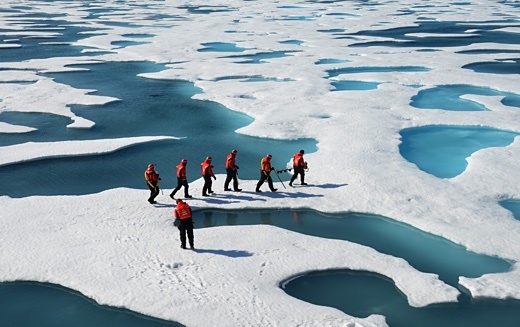 Image above: Scientists measuring thinness of ice in the Arctic around meltponds. From (https://fossilfreeri.org/2015/07/26/science-risk-and-morality/). The waters of the Pacific off the California coast are transparently clear. Problem is: Clear water is a sign that the ocean is turning into desert (Source: National Oceanic and Atmospheric Administration, NOAA). After all, global warming hits the ocean much, much harder than land. Up to 90% of anthropogenic (human-caused) global warming is absorbed by the ocean, which is fortuitous for humans. Just imagine the chaos if the situation were reversed: Mobs of regular ole people morphing into maddened gangs striving for food, huddled in far northern latitudes while Mid America scorches brittle crops in sandy soil, a dystopian lifestyle. Scientists classify the Warm Blob phenomenon as “multi-year ocean heat waves,” with temperatures 7° F above normal and up to 10°F above normal in extreme cases. How would humans handle temperatures, on average, 7° to 10°F above normal? There’d be mass migrations from Florida to Alaska, for sure. As it happens, sea animals do not do well. They die in unbelievably massive numbers; all across the ocean… the animal die-offs are unprecedented. Scientists are stunned! Masses of dead starfish, crabs, and fish wash ashore in Nova Scotia, and there are more and more…. In fact, entire articles are written about specific areas of massive die offs, for example: “Why Are Chilean Beaches Covered With Dead Animals?” Smithsonian.com, May 4, 2016. Chilean health officials had to resort to heavy machinery to remove 10,000 dead rotting squid from coastlines earlier in the 2016 year. Over 300 whale carcasses hit the beaches and 8,000 tons of sardines and 12% of the annual salmon catch… all found dead on beaches, to name only a few! You’ve gotta wonder why? According to Nate Mantua, research scientist at the National Oceanic and Atmospheric Administration’s Southwest Fisheries Science Center in Santa Cruz, California: “One of the things that is clear is there’s a lot of variation from year to year along the Pacific Coast, and some of that is tied into natural patterns, like El Niño,’ Mantua said. ‘But what we saw in 2014, ‘15 and the first part of ‘16 was warmer than anything we’ve seen in our historical records, going back about 100 years” (Mary Callahan, Year in Review: Ocean Changes Upend North Coast Fisheries, The Press Democrat, Dec. 25, 2016). Fishermen bitterly claim the ocean is changing like never before. Meanwhile, scientists study those weird changes but do not fully understand the problem. Unfortunately, the general public does not see changes hidden within water; otherwise, they, the general public, might organize and demand their politicians in Washington, D.C. fight climate change/global warming. According to John Largier, professor of coastal oceanography at UC Davis Bodega Marine Laboratory, “Climate change syndrome is definitely having an impact,” Ibid. As it happens, the world climate system is interconnected, interwoven such that climatic stress originated at sea spills onto land, e.g., the Warm Blob was first observed and linked to a high-pressure ridge stationed over the north Pacific in 2011. This ridge diverted winter storms, thereby exacerbating California’s drought meanwhile weakening winds that ordinarily absorb ocean heat and stir up the cold water necessary for immensely productive Northern Coast breeding grounds for marine wildlife. Bottom line, the ocean ecosystem is under fierce attack, and it is real, very real indeed with too much global warming, too much ag runoff, too much heavy-duty massive overfishing, likely too much nuclear radiation. The ocean absorbs anthropogenic CO2 emissions from fossil fuels, similar to the upper atmospheric The ocean absorbs 90% of the heat that is generated CO2. Thank your lucky stars for that… but only temporarily! There is deadly acidification in the ocean caused by excessive CO2 concentrations (already damaging pteropods at the base of the marine food chain).